Day 22 of our 30 Days of Cozy brings us this beauty! The Nordic Tree Pillow Crochet Pattern from Meghan of Meghan Makes Do. 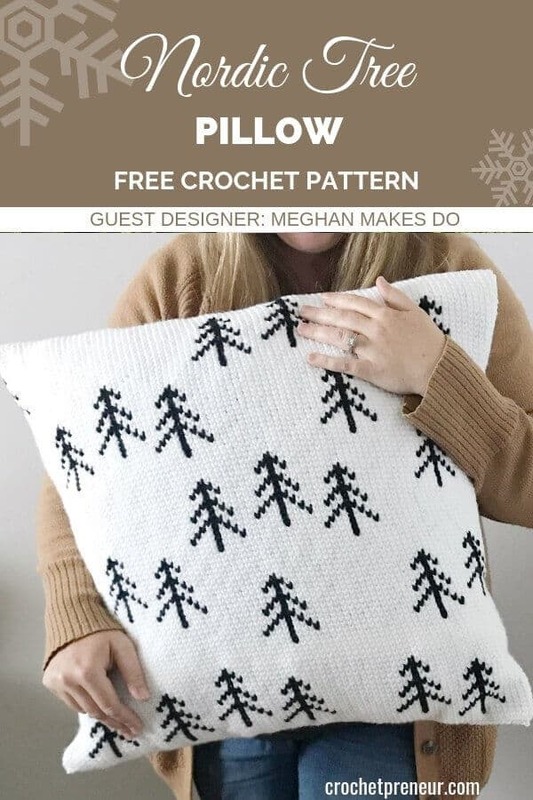 Meghan was so gracious in taking time out of her own jam-packed design schedule to create this monochromatic, classic Scandinavian style pillow just in time when we’re all thinking about pine trees and falling snow. When you create this pillow, you’ll be all set to cuddle up on a winter’s eve with your favorite cocoa and a good book and you’ll be feeling all the hygge vibes…add a warm blanket and you’re all set. To see what else Meghan’s been working on, check out her series of C2C blankets, 4 in all, that she’s come out within just the last month. Then, scroll down to grab your stitching chart and get to work on your very own Nordic Tree PIllow. Purchase the premium pattern which includes written and charted instructions for the Nordic Tree Pillow. Find it on Ravelry or Etsy. Swatch instructions: Work your swatch in rows using center single crochet or create a small loop with about 22 stitches to work in the round. Pillow is worked in a continuous round. Do not join at the end of rounds. The entire pillow is made using center single crochet stitches. Color work is done using the Fair Isle crochet technique. A graph is provided. For written instructions, you can purchase the PDF version. Graph is read right to left for each round. Float the secondary color as you go making sure to catch the yarn every 5-6 stitches. Finished pillow before adding insert measures 22” wide by 21” tall. Center single crochet is worked just like single crochet, but the hook is inserted in between the front two posts. Fair Isle crochet is a technique used for color work. For all secondary colored stitches, use the Fair Isle technique and center single crochet. Insert hook into stitch, yo with secondary color, yo and finish stitch with primary color. For Fair Isle colorwork in crochet, float your secondary yarn along the wrong side of your piece. Catch the yarn every 5-6 stitches. To catch yarn, lay it over top of the hook before the first yo. Using color A ch 166, join to first ch with a sl st making sure not to twist the chains. Continue rounds using the graph below. Remember that each round is read right to left. Use Center Single Crochet from here on out and the Fair Isle crochet method for all Color B stitches. Fasten off leaving a long tail for sewing. Weave in all other ends. Fold piece in half and using the long tail sew the top closed with a whip stitch. Insert the pillow form and then sew up the bottom using a long piece of color A yarn. Weave in ends and enjoy! Download your Nordic Tree Pillow crochet chart. If you prefer an ad-free pattern with written instructions, as well as the chart, find it on Ravelry or as part of the 30 Days of Cozy Bundle. I know you’re going to love making the Nordic Tree Pillow and I so look forward to seeing your finished product. Meghan is a wife and mother of two living near San Francisco, California. Meghan has been crocheting for over 20 years and recently started designing her own patterns. After leaving the education field and becoming a stay at home mom Meghan decided to share her love of all things creative by creating the blog Meghanmakesdo. There she shares free crochet patterns, DIY projects, sewing tutorials, home preschool lessons and small business tips. She is passionate about helping others fall in love with all things crafty. When she’s not crocheting she can be found sewing, painting or going on adventures with her family.